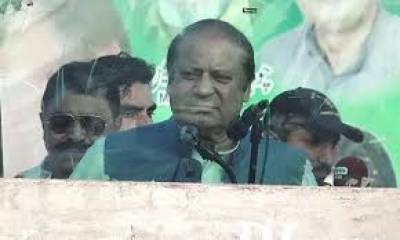 Muridkay (Staff Report): Former prime minister Nawaz Sharif’s 'homecoming' rally on Saturday reached Lahore via GT Road. Thousands of people welcome the ousted premier in the city. Earlier, addressed to a public gathering, Nawaz said that a few people cannot be the owners of the country. According to details, while Nawaz Sharif is on his way during GT Road power show in Muridke, he said that he does not face any corruption charge. He asked the workers not to be disappointed as they will be victorious at last and they will bring revolution. The former prime minister inquired that he had been ousted for not receiving salary from his son. “Does a father get salary from his son?”.